The Kills’ Jamie Hince and Alison Mosshart relish working with a constrained sonic palette: electronic programming, scorched-blues guitar riffs scuffed with distortion and effects, and tenacious vocals. Ash & Ice, the band’s first album since 2011’s Blood Pressures, had more unique limitations in place. Several years ago, Hince damaged his finger in an accident and had to re-learn his guitar technique. This hasn’t changed the Kills’ sound drastically—in fact, the gutbucket dirty-blues drone “Impossible Tracks” is one of the band’s catchiest songs—even if Ash & Ice does possess a pronounced electronic influence. These flourishes are invigorating, along with being well-suited to Mosshart’s conspiratorial vocals. The production on “Doing It To Death” resembles a percolating coffee pot; “Echo Home” has barely perceptible perforated beats underneath intimate, bent guitar warbles; and the Garbage-esque “Hard Habit To Break” boasts glitchy-sounding drum machines and staticky, drill-like riffs. “Days Of Why And How” and its chilly, minimal-electro backdrop is even better, mainly because Mosshart and Hince’s vocals intertwine to create a wary, seductive chorus. Still, Ash & Ice overall is more subdued than previous Kills records and on some songs, that works to the band’s advantage. “Hum For Your Buzz” sounds like a stripped-down tune from Mosshart’s other group, The Dead Weather, while highlight “That Love” is a meditative, scratchy piano ballad that sounds as if it’s being played on a vintage record player. In other places, the lack of aggression magnifies every songwriting shortcoming. The spongy, grungy “Bitter Fruit” is monotonous and crescendos to nothing in particular; “Heart Of A Dog” has a plodding tempo; and the repetitive “Black Tar” only avoids sounding flat due to its earworm guitar melodies, which brood in all the right ways. 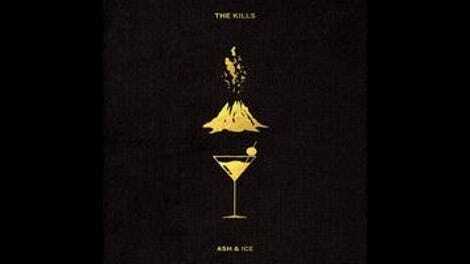 Ash & Ice is an incremental creative step in the right direction for The Kills. But the uneven execution demonstrates once again that the band’s undeniable live chemistry and charisma doesn’t always translate perfectly to its studio work.